Salford Red Devils have confirmed the signing of Wigan Warriors second-row Harrison Hansen for an undisclosed fee. Hansen becomes the 14th new arrival for the 2014 season and has signed a four-year deal at the AJ Bell Stadium. 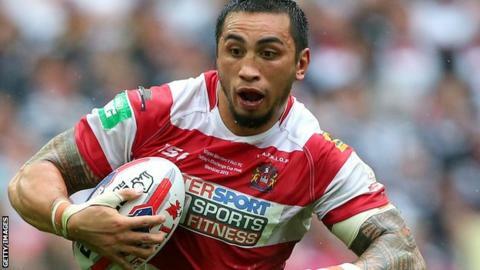 The 28-year-old had 12 months remaining on his Wigan contract, but chairman Ian Lenagan said the club had "negotiated a substantial transfer fee". Hansen told the Salford website: "For me it is a great new challenge. I have achieved everything I could at Wigan." Hansen had been at Wigan since 2004 and made over 200 appearances, winning the Grand Final in 2010 and the Challenge Cup in 2011 before last season's league and cup double. Internationally, he has represented New Zealand, then Samoa, who named him as captain for the recent World Cup, only for him to miss the tournament because of injury. "I am really excited to be here right at the beginning of this special time for the Red Devils," Hansen added. "I'm not just coming to Salford for an easy ride. I have a set of standards and I constantly set myself the task of living up to them. "There is a great bunch of players here, I know many of them already. The facilities now are second to none. This is the place to be."